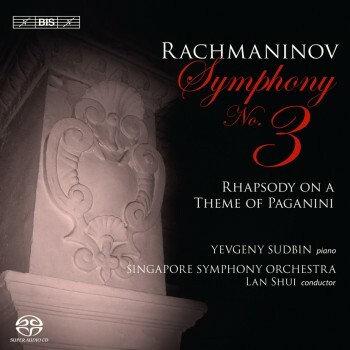 When Sergei Rachmaninov composed his Rhapsody on a Theme of Paganini in 1934, it was after an almost complete seven-year silence - so complete that he was thought to have renounced composing. Nevertheless, the Rhapsody was finished in only seven weeks, with a speed that was possibly stimulated by Paganini's theme itself; taken from the 24th Caprice for solo violin it had already been used by Schumann, Liszt, Brahms and Szymanowski and is ideal for variation. Rachmaninov's Rhapsody consists of twenty-four continuous variations, of which the 18th has become so popular that it is often included separately in compilations of 'classical favourites'. The variations fall into larger sections, forming a structure which has caused the work to be called 'Rachmaninov's Fifth Piano Concerto'. The soloist on the present recording is Yevgeny Sudbin, whose highly acclaimed discography includes a Rachmaninov solo recital, as well as a recording of the Fourth Piano Concerto described in BBC Music Magazine as an ' exhilarating, barnstorming, spine-tingling performance'.